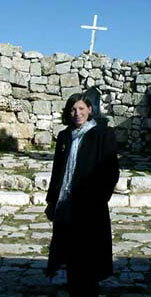 Message on Greek Orthodox Presence in the Holy Land by Maria C. Khoury, Ed. D.
September 2003 -- Jerusalem—With the loud chanting, the hand clapping and the young boys shouting and proclaiming their wishes to the beat of their tableh (small drum) I thought I was in the middle of Gaza at a funeral for another martyr during this Second Intifada (Uprising) but instead it was the middle of the Greek Orthodox Patriarchate of Jerusalem on the first Friday of September. A handful of young Palestinian Christian boys forming the Orthodox Youth Club in the Jerusalem area were participating in their own traditional way following the celebration of the name day of His Beatitude Patriarch Irineos I, Greek Orthodox Patriarch of Jerusalem. The boys were proud to wish His All Holiness a happy name day in this very loud way by shouting in Arabic that in soul and in blood they are Christian while handing the Greek patriarch a large beautiful oversized bouquet of flowers. These young boys with their youth leader, Nehleh Ateh, waited until the crowds left, until the speeches were over including the warm words afford by the Greek Consul General in Jerusalem, Mrs. Eleni Sourani, and began to declare and shout that Christianity will live forever in Palestine. I was amazed at the patience of the patriarch because he found a very diplomatic way to interrupt them by insisting to take a photo with these energetic young boys and told them how proud they make him by their mere attendance of this event. Certainly not large in numbers but strong in spirit and persistent that Christians belong in the Holy Land. At the end of the racket, I asked one young man, wearing a white T-shirt of the Resurrection Icon, if he feels Christian youth will even exist fifty years from now in the Holy Land and he responded in Arabic by saying "if there is love and faith" surely Christians will be present. Impressed by such a serious answer from a young person, I asked for his name and he said "George." Speaking a littler further with the Orthodox Youth Club members I had a George to my left and to my right and I began to smile thinking of the scene out of "My Big Fat Greek Wedding" with everyone named Nick, Nicki and Nick. Never did I realize before how many people carried the name "George" in this small Palestinian Christian community. The great martyr Saint George is a dearly beloved saint in the Middle East and his relics are here in the Holy Land in the Church of St. George in Lod. He was martyred in the early 4th century for his Christian faith. He might have never really slew a dragon since there are amazing myths told about Saint George because the image of him killing the dragon is a symbol for good winning over evil with the saint representing "good" and the dragon representing "evil." Even in our tiny Christian village of Taybeh there are three churches named in honor of St. George. Although a great hero he was put through unspeakable tortures which he bravely endured. The Orthodox Christian community in the Holy Land today is in a hostile environment very much like during the time Saint George served in the Roman army and even a century before when the first twelve Apostles drew together the first multinational congregation and formed the Christian community in the land where Christ's Holy Resurrection took place. The Mother of Churches, the Holy City of Jerusalem, with the Patriarchate of Jerusalem as its focal point, remains to this day the primary bearer of the message derived from the empty Sepulchre. Main custody of this sacred place and the majority of the holy sites remain the responsibility of the Greek Orthodox Patriarchate since the time of Constantine the Great from the fourth century. However, by the time the Church was liberated by the Emperor Constantine the Great, very few Christians were left in the Holy Land because Jerusalem was razed to the ground on August 10th in the year 70 A.D., and persecutions of Christians followed one after the other. The head of the Christian community who actually became the first bishop of Jerusalem, James, died a martyr's death as well about ten years before this catastrophe. Although the Christian community was small in the fourth century during Emperor Constantine's time, it actually began to grow as result of the ceaseless effort of certain holy people, bishops, priests, nuns and monks whose missionary activities attracted Jews and Greek Pagans to the Christian faith. The dedicated work of these early Christians helped elevate the Holy Land to the center of spiritual growth in the Middle East. The Church in Jerusalem has to be seen in a special way because not only today but throughout the two thousand years it did not serve the parishes of Jerusalem Christians alone as just in any other city. The Church in Jerusalem must be viewed with exceptional significance to Christianity worldwide. All of the holy sites and sacred places where the Lord Jesus Christ walked, performed miracles, spoke about forgiveness and love for one's neighbor must be embraced as having universal value. The Holy Shrines opened to the public for the first time in the month of September in the year 335 A.D. During their lifetime, Constantine the Great along with his mother, Helen, build many churches in the Holy Land that Jerusalem became what some people called the magic city of the Middle East and during this period the Holy Land began to be recognized as the homeland of Christianity. This glorious identity stayed for a few centuries as Jerusalem became a Christian majority until, of course, the Persian Invasions where many churches were destroyed and Christians were slaughtered at the hands of fanatics. The Church of the Holy Sepulchre was completely torn down and destroyed when the Persians captured Jerusalem in 614. I am truly amazed with the faith and dedication that St. Constantine and St. Helen possessed to use their money, most of the empire's wealth and their authority in order to build churches and give glory to God. They literally created a place of pilgrimage for all Christians. From my personal experience, I truly believe these remarkable holy people and the ones that come after them and rebuilt the Holy Sepulchre helped us preserve our Christian roots and identity in the precious land where Christ chose to be born in and to deliver the message of salvation based on pure love. The Holy Places are a reflection of hope for all people by showing humanity the image of God, which is Love. Jerusalem was always used to having thousands of believers flock the Holy Places. The fourth ecumenical council raised the bishop of Jerusalem to the rank of Patriarch which entailed the right to ordain metropolitans and bishops of Palestine and to convene and preside over local councils. Ever since than, the Patriarch of Jerusalem has been equal to other Patriarchs. However today, the Patriarchate is suffering from too many scandals and this sacred Holy Land has seen too much bloodshed following the inhuman Israeli military policies especially with the onset of massacres of Palestinians since the Uprising in September 28th 2000. Currently, the Christian community stands at less than 2% of the total three million Palestinians that live in the Occupied Palestinian Territories (West Bank) and Gaza. Furthermore with this turmoil and confusion many people including the Palestinian youth singing in the Patriarchate might not understand the Greek Orthodox legacy in the Holy Land which was expressed by the Lord Jesus Christ Himself in John 12:20-23: "Now there were certain Greeks among those who came up to worship at the feast. Then they came to Philip, who was from Bethsaida of Galilee and asked him, saying: Sir, we wish to see Jesus. Philip came and told Andrew, and in turn Andrew and Philip told Jesus. But Jesus answered them saying: The hour has come, that the Son of Man should be glorified." Therefore, the Church of Jerusalem, with the grace of God, will continue to give glory to Christ our Saviour, and to pass the tough battles and the spiritual wars and react with non-violent resolutions to the military occupations that it has experienced throughout its existence. The Greek Orthodox Patriarchate today must aim to safeguard the privileges that even the Islamic Caliphs have respected for centuries so that the Holy Places can remain intact and fulfill their sacred mission. Thereby allowing the Christian presence in the Holy Land to reflect Noor El Masieh (the Light of Christ, Phos tou Christou).